I have employed the practice of applying uncommon thought to common challenges throughout my career. I’ve often danced on my own planet, as an individual and a Content Strategist — hey, I dress like Prince in corporate America, so, this shouldn’t be surprising. Yet, during Kristina Halverson’s Minneapolis CONFAB 2014 Conference, which I attended in early May, this practice resonated so much it shook me to my core. The final day of the three-day conference featured keynote speaker, Nilofer Merchant, founder of Rubicon, and author of The New How and 11 Rules for Creating Value in the #Socialera. In 1996, when Steve Jobs returned to Apple, I was in charge of an industry-recognized channel program for the company that was responsible for growing a $2M business to $180M business in 18 months. By working with a few dedicated partners — some were called “value-added-resellers” and some were national retailers such as Best Buy — Apple was able to grow its sales exponentially. And he was right. Getting to that next growth market takes more than being unhappy with your current results … and it takes more than being willing to change. You have to be willing to do what feels unnatural. As Content Strategists, how we “see/k around corners and unlearn” depends on our willingness to change, we cannot be shy about it. We can get too focused on process, protocol, and deliverables. We must remember that we have the ability to produce magic within structure. We can stumble upon an inkling, a solution that completely “wows” the client and our delivery team. How can we create more of these moments? In a social era where connected individuals can now do what only large corporations used to do, it’s imperative to do things “like nobody else.” Doing so invites purpose, which brings out the best people, and the best in people. Purpose is the voice of our “onlyness.” And it is definitely worth incorporating into our wide-ranging content marketing roles. And though we may feel our thoughts will be silenced by decision-makers outside of our pay grade — that is ok. I have learned that although the crowd may “ooh” and “awe” over the garment worn by a model who struts down the runway, someone contributed to the makeup; another person selected the shoes and the jewelry, etc., to bring the model’s entire look together. Subtle or understated, there’s still a stamp of “onlyness” that’s viable and bold and traceable to someone, some talent. If it means going beyond content audits, requirements, and the traditional list of deliverables for the design phase, do so. When I led a multimillion-dollar employment branding effort for a former employer, as the project unfolded, our delivery team thought it would be more valuable to produce a video to socialize the new brand than merely a document. Yet, our project sponsors said, “No, just give us the document; we don’t have time for a video.” We explained that something as groundbreaking as an employment brand requires emotional investment; it requires rich storytelling, vibrant imagery, and bringing brand pillars to life. And we could achieve this better via a video versus a static PowerPoint™. Furthermore, we were able to produce the video within budget and the project’s timeline. Needless to say, our “minority viewpoint” was a big hit! So, if the talent that you bring to the table calls for rapid interface prototyping versus prolonged development or rich media storytelling versus print articles, then so be it. If the ideation does not mitigate the integrity of the client solution or the budget, go for it. It’s your “onlyness;” it’s your innovation in motion … embrace it. Even if you’ve applied the lipstick and not the full dressing to the end-solution or content marketing model, it still features your stamp, and it looks good — no, it looks fierce (finger snap)! 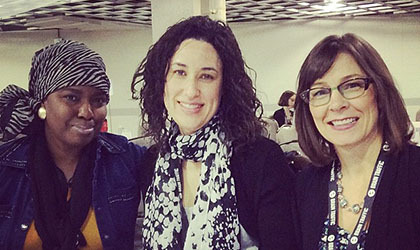 Kimberly Easley, Courtney Gaillard and Kerry Ellis at CONFAB 2014.